Teachers in Cumberland County are prepping for the rally in Raleigh on May 16. FAYETTEVILLE, NC (WTVD) -- With plenty of poster board and markers in every color, teachers in Cumberland County spent Friday night gearing up for a fight. Admittedly, a little late. "It makes me feel kind of ashamed that we weren't able to lead the way with this," said Joseph Sorce, a kindergarten teacher at Fayetteville's T.C. Berrian Elementary School. "But, we're there now." Sorce is a soon-to-be-retired teacher in Cumberland -- the state's fifth largest district -- which only Thursday gained the critical mass of teachers needed to force the district to cancel classes May 16, so teachers can rally in Raleigh for more education funding from the state. ABC11 will be providing live coverage of the rally starting at 10 a.m. Until then, here's what you can expect. Locally, 12 school districts are shutting down schools down that day -- 35 districts statewide. That's about 969,000 students. About 63 percent of the state's public school pupils will have the day off -- while teachers like Sorce are rallying. "It's our students that we're trying to advocate for. They can't do it for themselves," Sorce said. 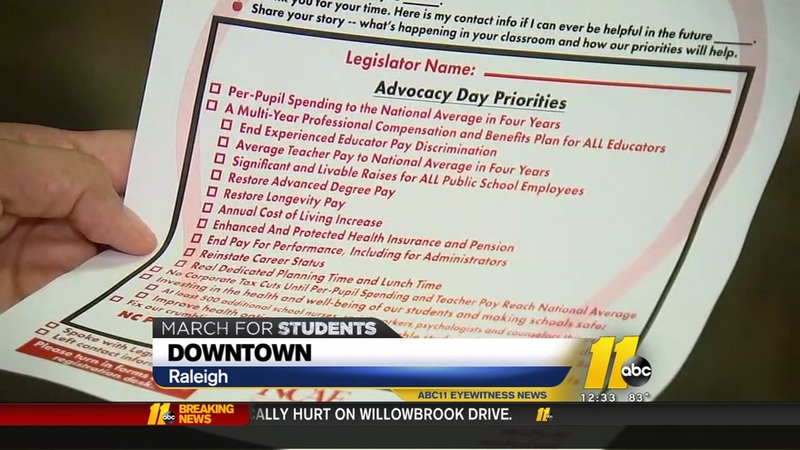 "So we've got to go to Raleigh and advocate for some of the things they need." As many of these teachers tell it -- they too often have used their own money to buy the basics of school supplies for their students -- filling the gap left by their under-funded districts. More than a third of North Carolina's public school students will have a holiday next week as schools close for teachers to attend a rally in the capital city. "I have two jobs. I work seven days a week," Carol Stubbs said. She is one of many Cumberland school staffers moonlighting to make ends meet. "I work Monday through Friday at the school system and on weekends, I work at B&B Bowling Alley Saturday and Sunday." Sorce says he's taken several extra jobs through the years to supplement his income as an educator. 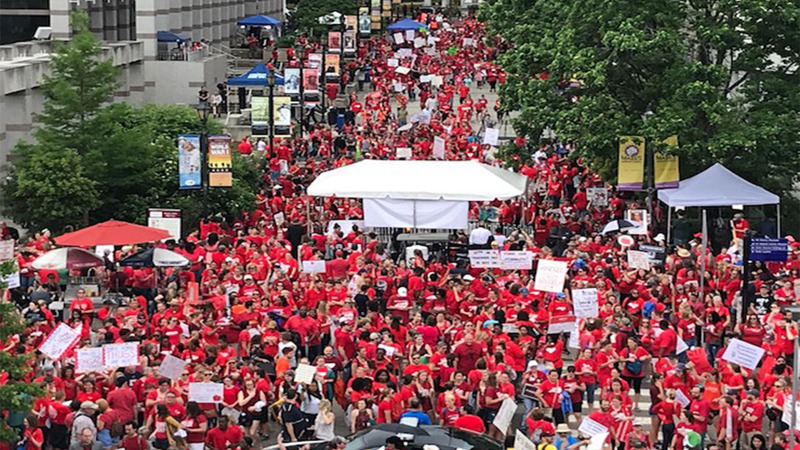 Some school districts and community organizations have contingency plans in place for May 16, when thousands of teachers plan to be in Raleigh instead of in classrooms. "I've actually donated plasma so I could have money for my family to put groceries on the table," he said. They're now counting on next Wednesday to change fortunes at home and in their classrooms. 400 teachers was the "magic number" of teachers required for Cumberland County to cancel schools. The teachers association is hoping to bring five times that many to join the 15,000 or so teachers on Halifax Mall for what will likely be the largest act of teacher political action in state history.